Meldingene som går ut til kunder på SMS og E-post i Shopify finnes bare på engelsk. For en norsk butikk gir dette en upersonlig opplevelse og kan skape misforståelser. Derfor har vi oversatt alle malene til engelsk, og du kan kjøpe rimelige språkpakker – med og uten installasjon. Takk for din bestilling, Din bestilling er sendt, Din konto er opprettet, Glemt passord – Dette er bare noen av malene. Alle SMS og E-postmaler inkludert (15+ stk). Sent to order notification subscribers when a customer places an order. Sent automatically to the customer after they place their order. Sent automatically to the customer if their order is canceled (if you select this option). Sent automatically to the customer if their order is refunded (if you select this option). Sent to the customer when a draft order invoice is created. Sent to the customer if they leave checkout before they buy the items in their cart. Configure options in «checkout settings». Sent automatically to a third-party fulfillment service provider when order items are fulfilled. Sent automatically to the customer when their order is fulfilled (if you select this option). Sent automatically to the customer if their fulfilled order’s tracking number is updated (if you select this option). Sent automatically to the customer after the status of their fulfillment changes to out for delivery. Sent automatically to the customer after the status of their fulfillment changes to delivered. Sent to the customer with account activation instructions. Sent automatically to the customer when they complete their account activation. Sent automatically to the customer when they ask to reset their accounts password. Sent to the customer when you contact them from the orders or customers page. Get notified by email whenever a new order comes in. You can also subscribe to the RSS feed for this store’s orders. I et Shopifytema er det i størrelsen 800 til 1200 fraser som må oversettes fra engelsk til godt norsk. Dette kan du gjøre selv, men tar vanligvis 5-8 timer. 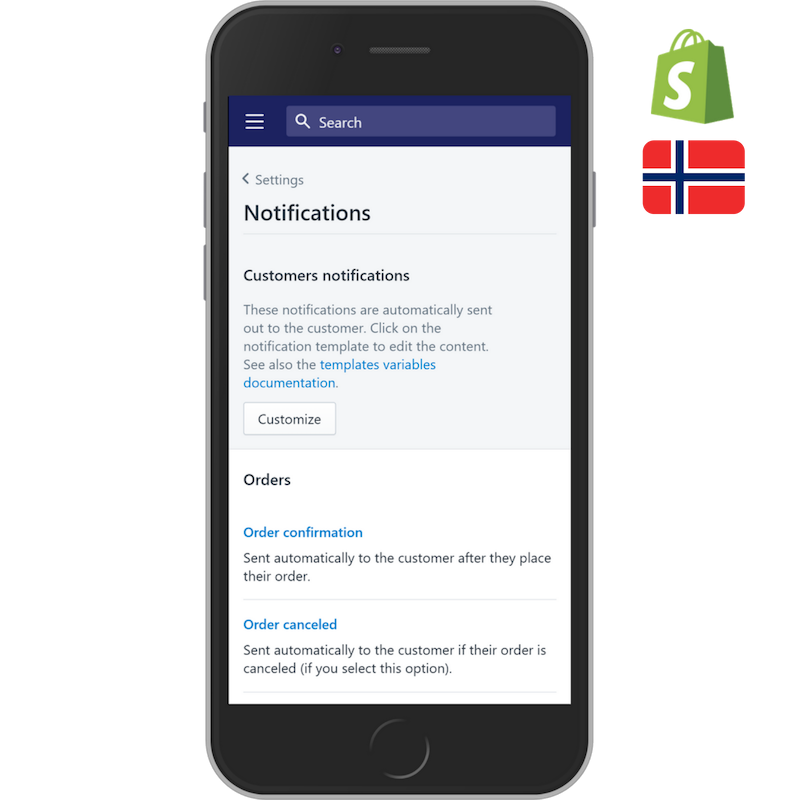 Vår oversetter har gjort mange oversettelser for Shopify-butikker, og oversetter alle fraser til godt norsk. Checkout/kasse-frasene er inkludert. Oversettelsen inkluderer at vi setter opp dette i butikken din, klar til bruk. Våre språkpakker blir satt opp innen 48 timer fra bestilling for pakker vi har fra før, der vi må gjøre oversetting på nytt er leveringstiden 3-5 dager. Priser eks mva.